Monday: All of Sandys Parish. Southampton Parish west up to and including Lighthouse Road from Middle Road to South Road. Tuesday: Southampton Parish east of Lighthouse Road. All of Warwick Parish. Paget west up to and including Chapel Road, S Hill and Southcote Road. Wednesday: Paget Parish east of Chapel Road, from, but not including S Hill and Southcote Road, and up to and including T-Street and Kent Avenue, Devonshire Parish. East Broadway. Cavendish Road. Pembroke Parish west of Blackwatch Pass. Thursday: Pembroke Parish east of Blackwatch Pass. Devonshire Parish east of T-Street. All of Smith’s Parish except the area east of Devil’s Hole Hill. 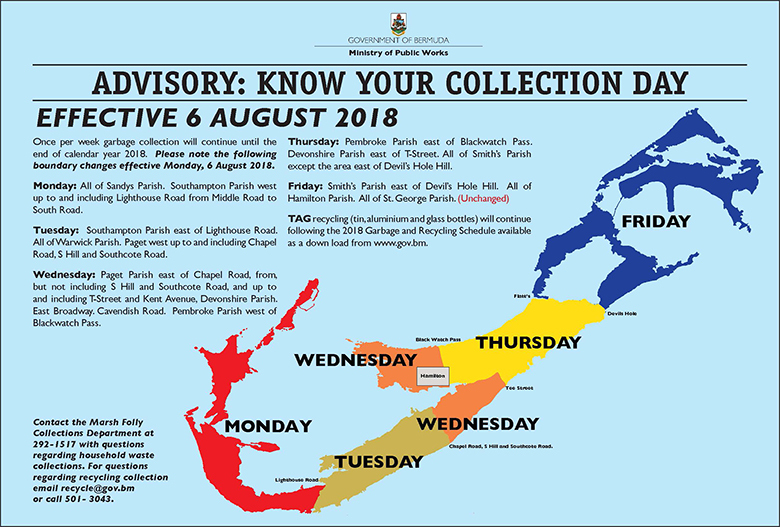 Questions regarding collection days should be directed to the Marsh Folly Collections Department – 292-1517. For questions regarding recycling collection email recycle@gov.bm or call 501- 3043. What can I put in my garbage? Household waste goes into closed plastic bags, preferably in lidded bins, for curbside collection. Household waste items include paper, cardboard, plastics and food waste. These items are collected and brought to the Tynes Bay Waste to Energy facility, where they are converted to electricity to help power Bermuda. vehicle batteries and motor oil – can be disposed of at service centres around Bermuda and at the Tynes Bay public drop off. If you are unsure about correct disposal, refer to the What Goes Where? Chart for assistance. Household batteries may be deposited in specially marked tubes at grocers, pharmacies, hardware stores and service stations island-wide. Vehicle batteries and motor oil can be disposed of at service centres around Bermuda and at the Tynes Bay public drop off. Recyclables are shipped to the United States where they are made into new consumer goods. You can dispose of bulky items at the Tynes Bay public drop off, located on Palmetto Road, Devonshire, which is open seven days a week. Saturdays: 7:00 a.m. - 7:00 p.m. Holidays: 9:00 a.m. until noon, but closed on Christmas Day. This facility has designated disposal areas for bulky items, hazardous waste items, household waste, eWaste, recyclables and other waste items. It is free and open to drivers of private cars and LP vehicles only. Organic waste—cooked or raw food and yard waste—can be composted in your own back yard. Waste goes in, compost comes out. Backyard composters are available for purchase from Waste Management for $80.00. Call (441) 278-0563 or email recycle@gov.bm to purchase an Earth Machine brand compost bin. The Marsh Folly Composting facility accepts leaf and limb waste and provides compost. This service is free service for drivers of private cars. Commercial drop-off is closed from noon until 1:00pm. Don’t pour cooking fats, oils, and grease into drains. The grease congeals and can cause issues in Bermuda’s sewer and wastewater systems. Instead, let grease cool in the pan and then wipe when cool with a dry paper towel. Dispose of the paper towel with your regular garbage. Alternatively, pour hot grease into a container and then transfer the cooled grease to your regular garbage. Illegal dumping is a serious crime with human health implications. Illegally dumped material can encourage mosquitoes and vermin which are disease vectors. Clean-up costs can result in thousands of tax dollars and man-power hours per year which could be put to better use. Under the Waste and Litter Control Act (2011) illegal dumping is punishable by fines of up to $10,000. Mishandled waste, or putting waste out for collection on the wrong days, in inappropriate containers such as paper bags, or after trucks have already serviced an area results in waste and litter pollution which also has human health implications. The Waste Education and Enforcement Officer works with neighborhoods to educate and help. Need waste and recycling bins for an event? The Waste Management Section provides free waste and recycling bins for events. Call (441) 278-0563 or email recycle@gov.bm to book. Are you a commercial trucker? Contact the Waste Management Section at (441) 278-0560 for commercial waste disposal guidelines and fees. 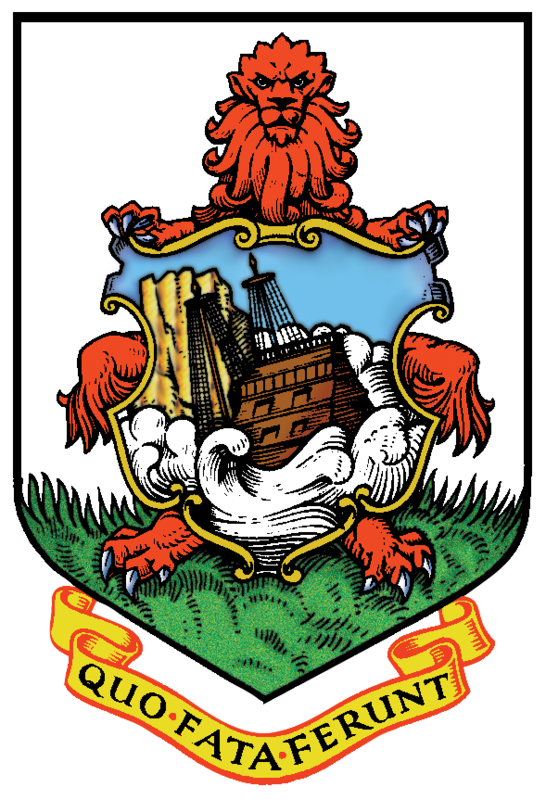 How to learn more about waste and recycling in Bermuda? The Waste Management Section's Education and Enforcement Officer works with schools, businesses and Bermuda's environmental NGOs to provide hands-on learning experiences, waste audits, waste facility tours, lunch and learns and volunteer opportunities. Call (441) 278-0563 or email recycle@gov.bm for further information.